I have not made “German” potato salad for Thanksgiving before, but I did this year just for kicks. Once again, we shall see how this works. I love family recipes which, based on what I’ve read, this is, from a good Lutheran family (read: German) in the Midwest. It was from the NPR show Here & Now just before Thanksgiving and well, any excuse to try a new German potato recipe – I will take it. 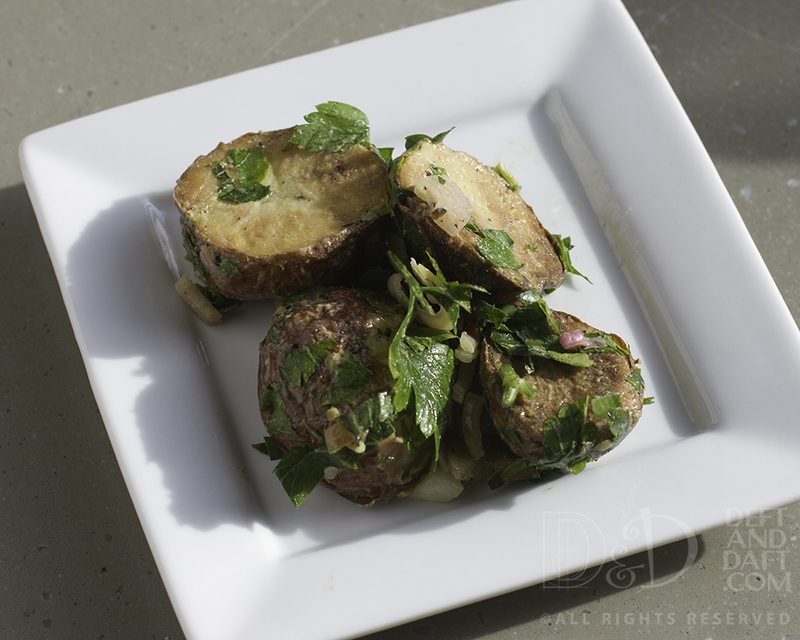 Place potatoes in medium sized pot, cover with water and bring to a boil over medium heat. Boil until tender but still holding its shape. Drain well, let cool and slice into 1/4 inch slices. Fry bacon in a large skillet until crisp. Remove bacon to paper towel-lined plate. Leave bacon fat in skillet. Cook onion in bacon fat until soft. Stir in sugar, salt, and pepper. Reduce heat to low and simmer until mixture is bubbly. Add water and vinegar and heat to boiling, stirring and watching carefully. Boil for 1 minute. Remove from heat. Add the potatoes. Stir until all potatoes are coated. Check seasoning. Serve warm. In my case for this Thanksgiving, I will reheat and add bacon just before serving. This was not bad, but did not live up to my ideal version from The Creamery. I honestly don’t think any recipe would. But I would give just about anything for that recipe. No, really, just about anything. Well, this was not the month for eggs. I had a slight serious thing for toffee and shortbread this month and neither involve eggs. So this month, my egg supply was used on some pretty amazing savory things. Summer always has me thinking of potato salad. I did the same thing last year. I really need to get to the local farmers’ markets to find some local red new potatoes. The By-Pass Market in Milton is one of my favorite places because they have excellent, local, new red potatoes – and lots of other amazing local produce. I am always tempted to roast new potatoes because they become sweet (like candy) and we just eat them right off the roasting pan. They are so addictive. So they never seem to make it into potato salad. I know what my future holds – a trip to the By-Pass Market. Ce weekend. I am a huge fan of chicken salad. I poach chicken breasts in water which I then save and serve to a totally underserving puppy – chicken water is an excellent thing for a pup. I usually make this simple – celery – peeled of course, shallots, Duke’s mayonnaise, a little Dijon mustard, parsley, and, of course, a few boiled eggs. Simple, but so very good. Will have to do better in June in both the butter usage and egg usage, but I am not thinking it is going to go well. I am still a little off my game, but I will make up for that. Yes. Yes, I will. You just have to work through things and to me cooking and baking makes me happy. Potato salad is really illusive. It really should not be so difficult. It is just potato salad, but it can be good or bad. And most of the time it is not good, just sort of meh. I have a few pointers from one of my best friends. While the potatoes are still hot, just dump that pickle juice on them – they totally absorb it. That does make a really good potato salad – it does. Set a pot of water to boil and salt it heavily – like the ocean. Add those Yukon Gold potatoes and boil until the potatoes are tender – which in my head means you can pierce them with a paring knife. Meanwhile, peel that celery (not kidding – a serrated peeler works the best), and then mince it. Mince the scallions too. Add to that the squeezed out sweet relish (my favorite kind) and you can add the relish juice to the cooked potatoes because that is pretty much amazing. Guess I should have said that earlier while the potatoes were warm but I think I did. Now let everything cool a bit. So after waiting, we do the following: Add those hard boiled eggs, and the parsley. Combine the Dijon, lemon juice and Duke’s and mixed until combined. Add to the potatoes, but don’t go crazy. You don’t want to break up the potatoes too much. I made this for Easter this year, along with Baked Beans. But this was one of those just wing-it-kind-of-recipes. And that is what I did. Looked at lots of recipes, bought 5 pounds of Yukon Golds and went for it. It seemed to be a hit for Easter, but I am also thinking about it again for this summer – you know, picnic time. I never have been on a picnic and that seems a damn shame – will remedy that, at least I hope I will. When we first moved to Pensacola, there was a restaurant in Gulf Breeze called The Creamery. You must understand that Gulf Breeze is only three miles across a bridge from Pensacola. The Creamery was a local mom and pop restaurant with great sandwiches, salads, German fare …. and they made their own ice cream – hence the name. The family that owned the place, the Schroeders, were always there and we really enjoyed going. At the time the Boy was young so ice cream was a draw, but he loved their club sandwich too. German food always has the MotH’s interest, so it was a win all the way around. My father-in-law loved the German food too. Miss that man. Damn it. My favorite part of the visit was without a doubt, the German potato salad. It was amazing, and I hold it up as the paragon of German potato salad. I would inevitably bring home a pint or so each time. I have tried and tried to find something that comes close, but have had no luck. Nothing has touched it and that makes me sad. This version is really good. 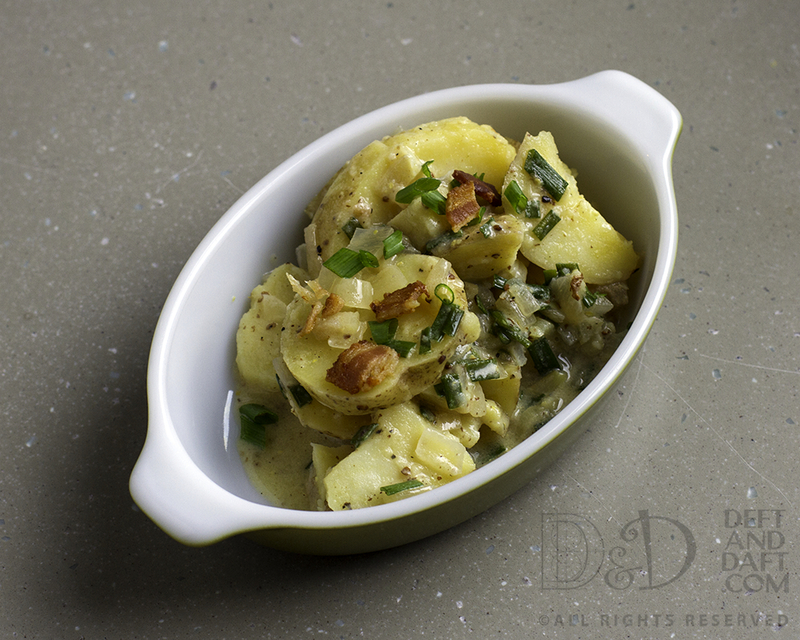 Not quite “my Creamery German potato salad” but – yep – pretty damn good. Finally, a German potato salad that is worth the effort. Thanks to Nancy Fuller. Put the potatoes in a pot and cover with water. Bring to a boil and reduce to simmer. Add salt and cook until potatoes will be easily pierced by a paring knife. Drain and put into a large bowl and sprinkle with rice wine vinegar. The potatoes will soak up the vinegar which is a very good thing. While the potatoes cook, place bacon in sauté pan over medium low heat and cook till crisp. Remove bacon, but leave bacon drippings in pan. Drain bacon on paper towels, crumble, and set aside. Add the onion to bacon drippings, season with salt and cook until very soft. Add the chicken stock, vinegar, mustard, and bring to a boil and reduce a good bit – probably by half in my opinion. Pour dressing over potatoes and coat. Add chives and top with bacon crumbles. Serve warm or room temperature. This is my modification of Nancy Fuller’s recipe of German Potato Salad. I think it is a great start to a German potato salad recipe and I did tweak it a bit. Right now, Yukon Golds are very inexpensive at the farmers’ markets, about .99 cents a pound and the potatoes are the size of somewhere between golf balls and baseballs. Very nice and cook up so well. These will always be my potato salad potatoes – I’ll leave the little red creamers for roasting – they are so like candy.